UN GiftBox campaign under way in Albania, raising awareness about Human Trafficking, in honour of the 30th of July, the World Day of Awareness against Trafficking in Persons. On the World Day against Trafficking in Persons, 30th of July 2018, the URAT network together with the office of the National Coordinator for Combatting Human Trafficking and Bridges, a network of organisations dedicated to the fight against trafficking in human beings, brought the UN Giftbox to Albania, for the 3rd year running. The UN Giftbox is a global initiative of the United Nations in the fight against human trafficking. The campaign took place at Lancua, in Vlora, with the participation of Minister Rovena Voda, National Co-ordinator of the fight against trafficking. Also present were Mr. Artemis Dralo, Deputy Prime Minister for Europe and Foreign Affairs, as well as representatives of the URAT network, local anti-trafficking institutions and national and international organisations. The Giftbox information was translated into Albanian language by the URAT network in Albania, in order to expose fraudulent promises used by traffickers of human beings, as well as exposing the inhumane conditions of trafficking and its consequences. A unique and eye-catching feature of the campaign is the life-sized Giftbox itself, which effectively draws attention and informs the public. The overall purpose of the campaign is to sensitize people to the risks of trafficking, help vulnerable communities protect themselves from traffickers, and help survivors of trafficking receive the necessary information for re-integration into society. Overall, this year’s campaign was another fantastic success, thanks to the collaboration and cooperation of each of the agencies who work so hard together toward achieving the common goal of combatting human trafficking and exploitation. 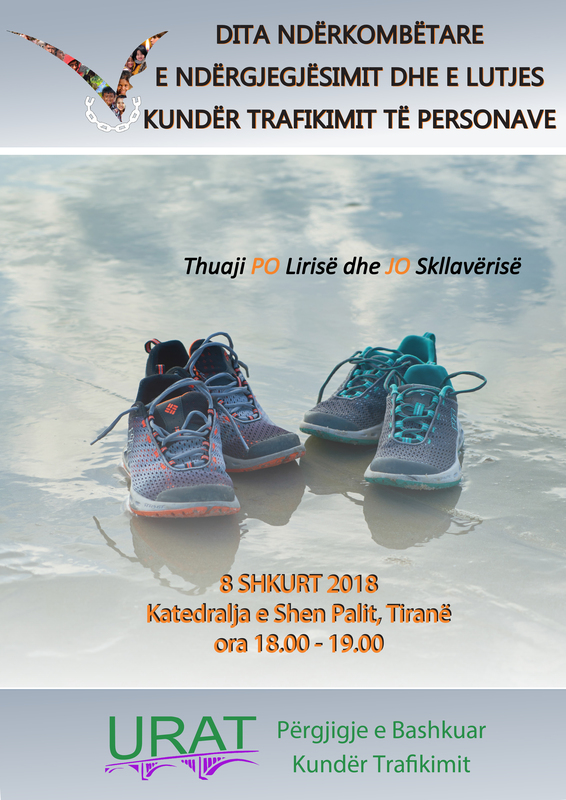 Event in Albania, 8 February, 2018- In honour of the International Day of Prayer and Awareness against Human Trafficking, feast of St. Bakhita. This year the theme for Bakhita Day: ‘’Say YES to Freedom and No to slavery: Migration without Trafficking’’, attracted many people to come and be present at the cathedral of St Paul in the heart of Tirana, Albania. This theme concerns all of us in every corner of the world. Here in Albania we have refugee camps and the country struggles to bring real justice to the many people coming through our borders. Thousands of Albanians are now refugees all over Europe and some caught up in the nightmare of human trafficking. This day helped us to focus on the details and the suffering, asking for pardon as we own our participation in such a global crime. The evening event was led by the Albanian network against human trafficking called URAT. Both the Archbishop of Tirana, George Frendo OP and the Government Minster against Human Trafficking, Rovena Voda, spoke movingly and with passion during this service, highlighting the many issues related to Human Trafficking and reflecting the stories which lead to such trauma. All members of the network participated in the evening event and bought with them many members of their organisations who are part of this ongoing effort to eliminate the world of human trafficking. The evening worship consisted of a shortened form of that compiled by Talitha Kum in Rome. It included the wearing of wrist bands distributed during the evening declaring our involvement ‘’Yes to Freedom and No to slavery’’, a film made locally on Safe Migration by MWL and two Power Points. One of these PP’s expressed the horror of the plight of refugees all over the world and the other, which was addressed by students from the Company of Mary School called ‘’Ylber’’, illustrated the many pieces of art work produced by the students as an anti-trafficking awareness raising campaign in the school. All the prayers and readings illustrated the plight of the trafficked and the need for all people to take action against such a crime and we were called to be in union with Pope Francis who is leading us in this action. The service in Albania involved a call to action in support of the refugees in the local camp in Tirana. All those present were invited to contribute to the care and the demanding upkeep of the many people from countries, mainly in the Middle East, who are resident in this centre. URAT, the Albanian network against trafficking, which meets monthly at Mary Ward Loreto, will implement this action within the next month. This will be in collaboration with the director of the refugee camp. The pictures of the evening, focusing on this issue, reflect very much the mood of the evening. Events taking place in honour of St. Bakhita, 8 February 2018- International Day of Prayer and Awareness against Human Trafficking. 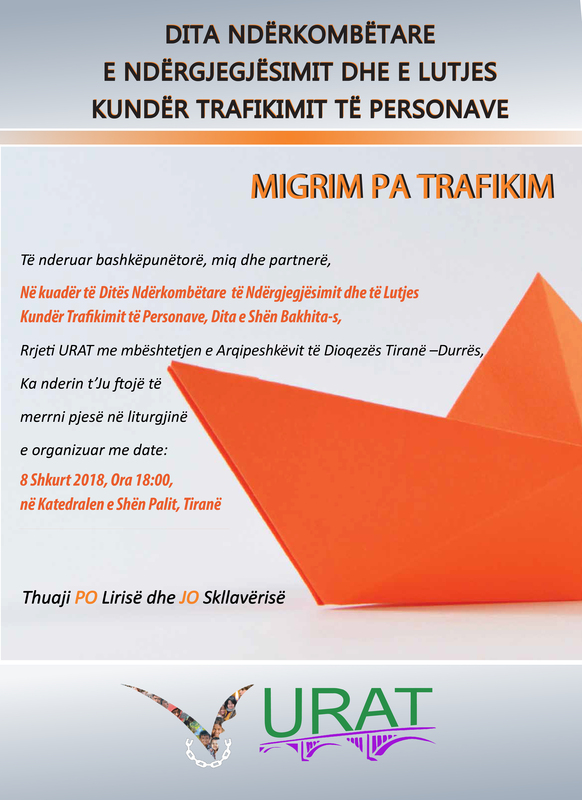 The URAT (United Response Against Trafficking) Network in Albania has prepared a Prayer and Liturgy Service which will be held at St. Paul’s cathedral, Tirana on the 8th of February. Confirmed attendance include the Deputy Minister of Interns/ National Co-ordinator against Trafficking in Persons, who will present a speech. Archbishop George Frendo will present the homely. This year, the network has chosen to concentrate on the theme Migration without Trafficking, and will be supporting the National Asylum and Migration Centre in Babrru, Tirana by means of food, materials and goods for the refugees currently living there. This action will take place post St. Bakhita Day. Watch this space for news and photographs!